Package includes 4 AirClean bags, one motor filter, and one super air clean filter. 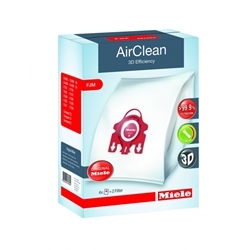 The new Miele FJM AirClean vacuum bags are an improvement over the earlier design. Over 80 years of experience have allowed Miele engineers to design a truly improved vacuum bag. The new design employs nine levels of filtration, improved air flow, high strength netting, and up to 30% improved performance and design over its predecessor. A new self sealing collar locks dust and contents inside of the dust bag so they do not escape into your home when replacing bags. One super air clean filter. Four super air clean filter.